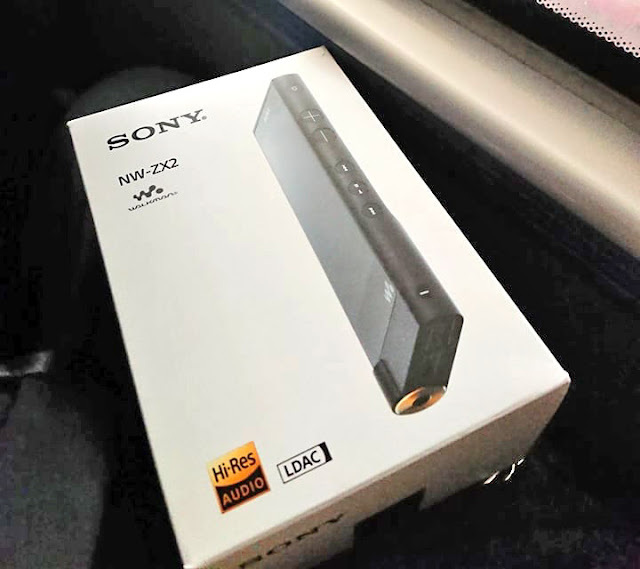 To be frank, I got like 2 draft items for posting I haven't finished, but as most people know, I love Sony and today I just got my ideal Digital Audio Player or DAP (or "MP3" Player/Music Player) and I'm over the moon! It's a Sony NW-ZX2 Walkman, and to expound, my ideal DAP is dedicated (it should JUST play music), can play/stream using Spotify, play my music files, do all of that well and be (preferably) a Sony! Granted it's old android tech, very few modern phones (if ever) can match it's audio capabilities as well as it's longevity, and the iPod though better than most phones or audio players can't play the more common high resolution audio format called FLAC (unless you do something to them, I'll you about it someday) which is why it's been on my wishlist of devices for a long long time. Fast forward 2 years and its still prohibitive price became affordable in the used market and so here I am, and here it is. Like most Sony stuff in the past (and some even today) tech specs are not given up easily, and though I'm a good researcher, it took awhile before I found answers. The ZX2 runs on an ARM-A9 Dual Core Processor at 300 MHz to 1.01 GHz with a PowerVR SGX 540 GPU. Definitely not cutting edge, even for the time. In comparison the LG v10 has a hexacore processor 4x1.4GHz, 2x1.4Ghz at $299 and the Sony Z5 was an octacore 4x1.5GHz, 4x2.0GHz at $400 - both a far cry vs the $1,199 of the ZX2 (yes, way too pricy, my major complaint about Sony) and the RAM? Where do I begin, mid range phones were using 2GB of ram and high end ones at 3-4GB while the ZX2 had a paltry (miniscule!) 685MB, yes, not even 3/4ths of a gigabyte! Which is probably why they settled for the 4.2 Android Jellybean OS and never upgraded. Now the rest of the specs are well known, music file playback capability, enormous storage and the rest which I won't get into detail anymore, what I gonna be writing about next is how to maximize the available resources of the ZX2. First off, you'll need to gain root access to the ZX2 so you can disable the non essential (for my needs) apps and release more ram for a snappier interface overall and reduce background apps that drain power and for that you'll need 360 Root, access it from your phone and just click on the first selectable bubble you'll see and allow it to download, this a one click rooting system that actually works with the ZX2, the more famous ones I've tried does not work. Turn on Unknown Sources for installing apps, run the apk, and it should install. Once it's installed and opened, it'll wait for your press to root the DAP, you need wifi on for this. It will do some stuff like trying multiple ways to root your DAP till it shows a smiley face and restarts the app. If it hangs, crashes or fails (sad face) just try again, it will eventually root. Run the app on root mode and you'll be greeted by screen 1. Translations provided per image, Page 2 Root Management is for controlling apps that can be granted root access like Titanium Backup. Page 3 is the Freeze Apps page, going to "apps to freeze" shows you a list of 'freezeable' apps, basically the only things I left are music apps and contact/calendar/maps (which can be safely frozen) - Frozen apps are not shown on the DAP and do not launch and of course save on resources and power usage. Thaw Apps will show you frozen apps that you can reactivate. I would suggest you freeze apps vs uninstalling them unless you have titaniumbackup and can backup every app on the DAP. Page 4 is the Menu page where you can turn on and off the root status of the DAP and uninstall root and app. Startup management allows you to toggle which apps launch on boot, while garbage cleanup is basically a DAP clutter cleaner like Cleanmaster. You can get as much as 200+MB of ram free (vs 120+mb) if you freeze most of the apps and prevent them from starting up. This results in a faster and more responsive ZX2, and theoretically, it'll last longer too. In the end, even if this is a 2 year old DAP with a 5 year old operating system with a 7 year old high end android hardware, I'm a happy man with a great sounding DAP. Until Sony releases an android powered DAP with even higher end musical performance, android Oreo, at least quad core at 2GHz with at least 2 gigs of ram that is.